75m as it appears in Smash. Unlock criteria Play 20 brawls as Donkey Kong. 75m (also written 75 m) is an unlockable stage in Super Smash Bros. Brawl, a Familiar Stage in Super Smash Bros. for Wii U, and a Starter Stage in Super Smash Bros. Ultimate. The stage is based on the 75m level of the original arcade version of Donkey Kong; however, it is a bit more remiscent of the NES port (in Brawl and for Wii U) rather than the original arcade version, but Ultimate changed the aesthetics of it to match the original arcade version. This stage is playable in 8-Player Smashes in Super Smash Bros. for Wii U. 75m also appears as a Masterpiece. The Donkey Kong Masterpiece begins on this level. The stage is a retro stage in the sense that it uses 8-bit graphics to replicate the look of the original game. Unlike Flat Zone and Flat Zone 2, the stage is not completely 2D, as the platforms and ladders all have depth (in Brawl and for Wii U), although this depth can only be seen in Ultimate by manually rotating the camera when paused or during a replay. There are many small platforms at the bottom part of the stage, but there is also a long platform on the top, and several larger platforms on the right. The bottom-most platform (with the bottom part of the two elevators) is in the background, so that players cannot land on it, but fall through it instead. The stage has walk-off blast lines on some of the platforms. 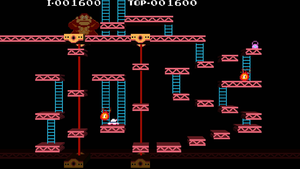 Numerous ladders connect some of the platforms, but the ladders next to Donkey Kong arcade sprite can not be climbed. In the center of the stage, there are two moving elevators with small platforms. The left one travels upward, bringing characters to the long platform on top and the one on the right travels downwards towards the bottom blast line. The platforms cannot be jumped through from above, only from below. 75m is the second largest new stage in Brawl after New Pork City. Masahiro Sakurai has stated that the stage is quite large, but the small platforms and dangers give the stage a cramped feel. A key part of this stage is the Donkey Kong arcade sprite, (who, according to one of Snake's Codec conversations, is actually a younger Cranky Kong), who sits on the long platform. He normally sits behind the stage in the background, but will sometimes light up and comes into the foreground. When this happens, the stage's usual background music will briefly fade out and play his theme for a few seconds, giving an opportunity for players to react before he attacks. While he is in the foreground, contacting him causes moderate damage and knockback. Four jacks will also bounce in from the left at irregular intervals (for example, Donkey Kong can throw one jack, briefly pause, and then resume throwing the jacks) and fall after they bounce off the long platform, also causing damage and knockback. After a certain amount of time, Donkey Kong will go back into the background. All items from the original Donkey Kong game return as items in the stage, which are the Trouble Bugs, jacks, the purses, the umbrellas, and the hats. The Trouble Bugs move along the platforms and ladders, and cause fire damage and knockback upon contact. The purses, the umbrellas, and the hats can be picked up if a character touches them, and this has no effect on gameplay. The score in the top left-hand corner increases by 800 each time an item is picked up, but this also has no effect on gameplay. Gameplay on 75m tends to take place in the upper right-hand corner. This area is much more flat and has fewer gaps than the rest of the level, and is much less prone to random objects flying out and KOing players. While a large stage in terms of blast lines, it tends to feel cramped because of the many small platforms. Also, because the majority of the fighting takes place in the upper right hand corner, the stage tends to feel imbalanced towards that side. In general, it is quite difficult to KO a player off the left or bottom edges, while it is rather easy to do so off the top or right. While not much has changed in the stage when ported to Super Smash Bros. for Wii U, the platforms on the right have been changed into regular platforms instead of walk-offs. This makes the platform where Donkey Kong appears the only walk-off on the stage. In addition, several platforms have been changed allowing players to pass through them from above, allowing more mobility in the stage. 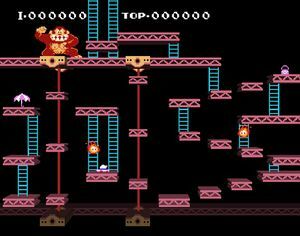 A platform connected with a ladder can not be passed through however, with the exception of the unclimbable ladders next to Donkey Kong; the elevators can not be passed through from above as well. Furthermore, while Donkey Kong is in the foreground, only one to two jacks at a time will bounce in as opposed to four, reducing the number of active hazards. Donkey Kong still pauses occasionally for a good time before resuming his throwing. In Super Smash Bros. for Wii U, the Ω form features a triple layer platform of girders (quadruple layer platform of girders in Super Smash Bros. Ultimate). Some parts of the original stage can be seen faded in the background. The Retro Donkey Kong will not throw any jumping jacks, and enemies or collectibles appear only in the background. In Super Smash Bros. Ultimate, the Ω form and Battlefield form are similar to SSB4's Ω form; however, they are resized and reshaped to match Final Destination and Battlefield, respectively. The three soft platforms of the Battlefield form resemble the girders of the main platform but thinner. The appearance of 75m in Donkey Kong. 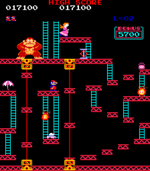 This stage is based on the 75m level of the arcade game Donkey Kong, in which Mario must maneuver through obstacles such as vertically moving platforms, bouncing jacks, and Fires. If Mario falls from a certain height, get hit by the jacks, or touches a Fire, he loses a life. Mario also has a chance to earn more points by collecting items in the stage, which include a hat, parasol, and purse. 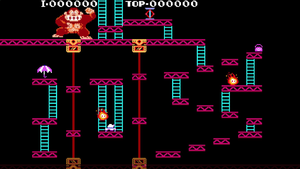 This stage is an accurate recreation of the 75m in the NES port of Donkey Kong; however, the bottom-most platform is now in the background and cannot be landed on (in addition to jacks only appearing when Donkey Kong is in the foreground, instead of all the time as in the original game). Due to the stage's cramped feel, large size, dangerous hazards, generally unusual layout, and overcentralization towards the upper area, 75m has been banned from tournament play, as it is too difficult to play a proper competitive match on. A glitch can occur on 75m playing as R.O.B. If R.O.B. grabs the left ledge of a certain platform near the bottom right of the stage, R.O.B. will be teleported onto the left platform facing to the right. Luigi pointing at a Trouble Bug. The DOJO!! 's page on 75m gives the stage's name as "75m" (without a space), and the music track "25m BGM" is formatted without a space, but the stage name in-game has a space (as "75 m"). However, under SI standards, SI units (meters, in this case) should have a space separating the number and the units (representing multiplication), and the stage's name is formatted with a space in the arcade and Game Boy versions of Donkey Kong. This is the only stage in Brawl with no tracks unlockable for its My Music options beyond its original tracks. All three of the songs that play on this stage in Brawl include the 25m theme in some shape or form. Although the stage most closely resembles the arcade version of Donkey Kong (including the appearance of Pauline's hat, which is absent from the NES port), in Brawl and SSB4, all sound effects are taken directly from the NES version of the game. However, Ultimate uses the proper arcade sound effects. In Super Smash Bros. 4 music from the Mario universe can be played. This is likely because the Donkey Kong marked the beginning of both Mario and Donkey Kong universes. In addition, Mario was playable in that game. This is one of the two familiar stages in SSB4 to not appear in Classic Mode or All-Star Mode. The other is Temple. 75m Page on Smash Bros. DOJO!! This page was last edited on April 16, 2019, at 15:52.